What are we waiting for? 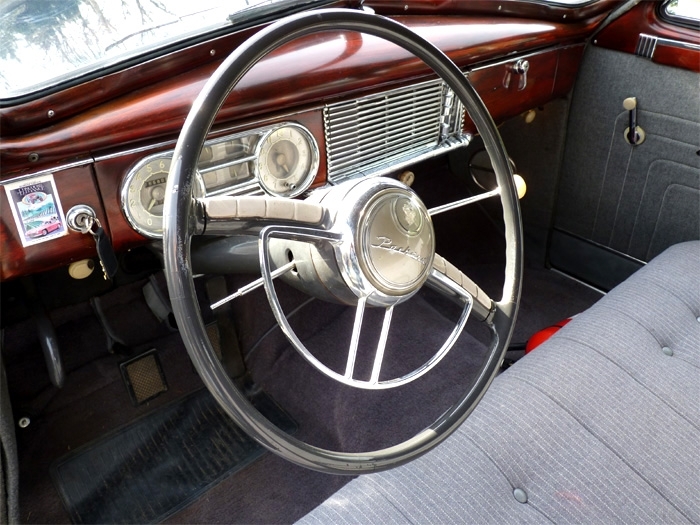 Let’s drive our Classic cars now and not wait for tomorrow when the sun is shining. 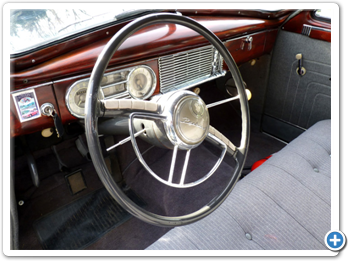 Let’s drive our Classic cars and show the rest of the world what they are all about...What are we waiting for? Tick tock. I agree--you only live once! But what about those who want to keep their cars in show condition perennially? 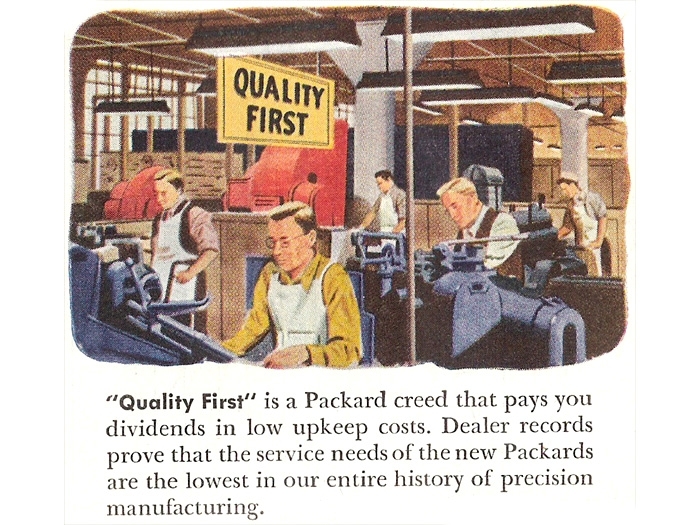 Especially after a time-consuming and expensive restoration. 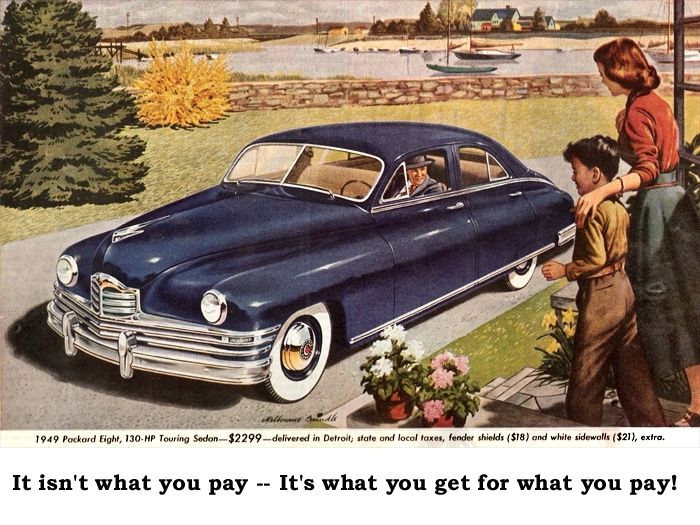 The simple answer is the addition of a “driver,” a car that is intended to be driven for transportation and enjoyment--not just to shows and parades. 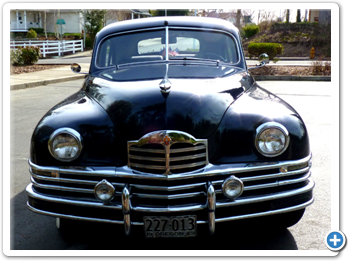 Matt and Karla Hackney own several collector cars but it’s their 1949 Packard that provides the most driving enjoyment. 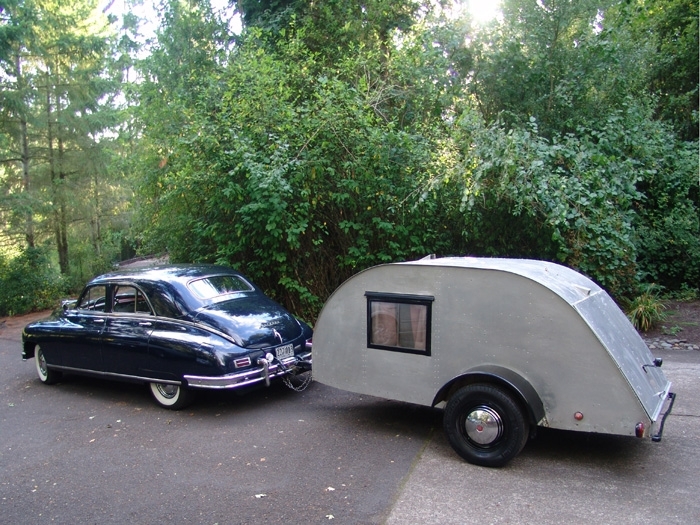 They take it on club tours, to club meetings, estate sales, picnics, and even camping (towing a teardrop trailer). 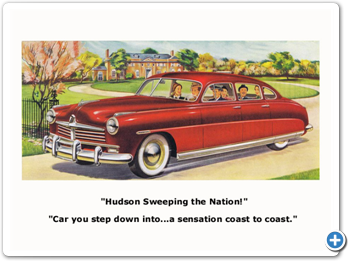 In addition to being their driver, this Packard is also their first collector car, purchased in 1995. 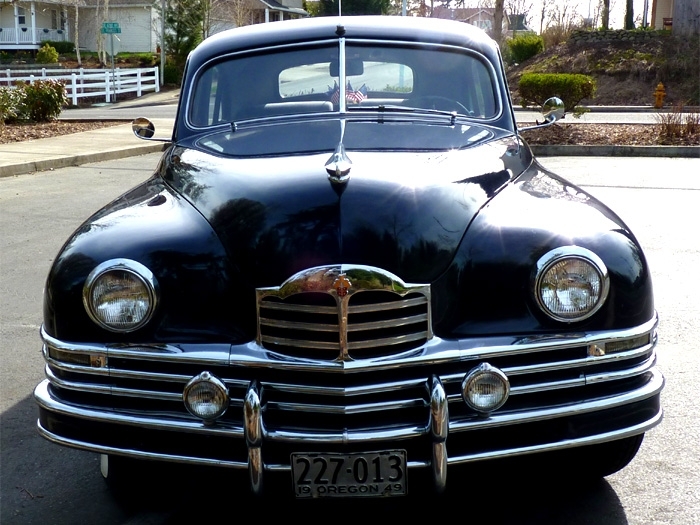 Their 1949 is a 22nd Series Packard, which included ’48 and some ’49 models. Some collector cars look nice but leave a lot to be desired when it comes to handling. The Hackneys found that just replacing the tires made a big difference. 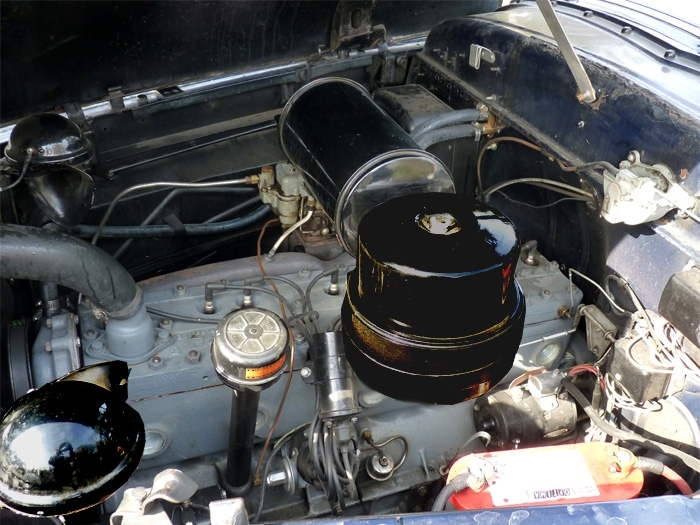 Dual master cylinders were not required by law until 1967, so a failure at any point in the hydraulic system can cause total brake failure on older cars. With that in mind, it is extremely important to maintain and occasionally test the parking brake, as Matt can attest. 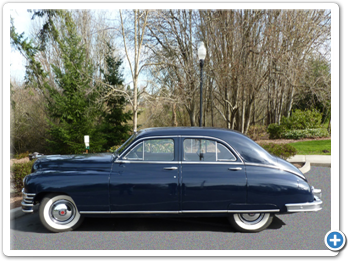 The 1948-50 Packard body has always been controversial, winning styling awards on one hand and garnering unflattering nicknames on the other. 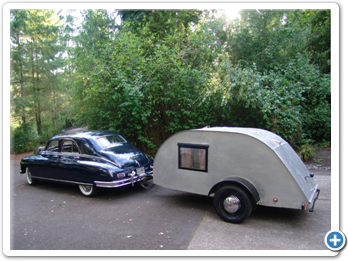 As one might expect, U-Haul does not have a hitch kit for ’49 Packards so Matt and his brother-in-law did a custom installation. 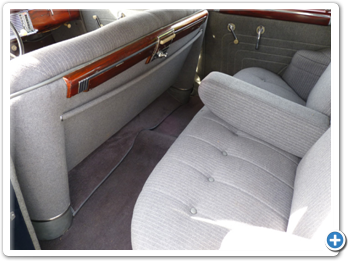 The joy of a driver car is that it can provide enjoyment while being restoted, a little at a time. 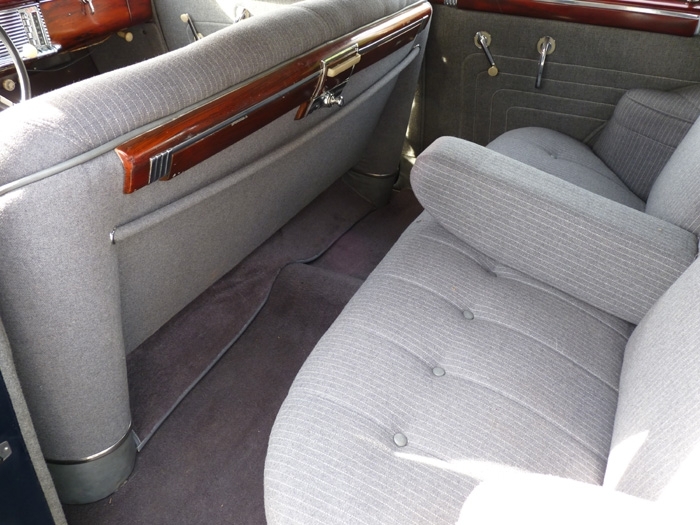 “The upholstery was done when we got the car,” said Matt. “The gentleman we bought it from had his apprentice do it and it looks pretty good. The paint is a repaint and it wasn’t that great so we cleaned it up and now it’s about a 15 to 20 foot car. 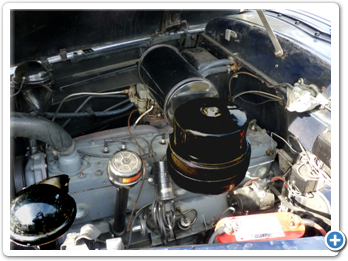 “Over the years we’ve had the engine rebuilt, installed new wiring, rebuilt the brakes, replaced all of the glass, and replated a lot of the chrome. “We’ve got a lot more into it than it will ever be worth, but it is probably my favorite car to drive. 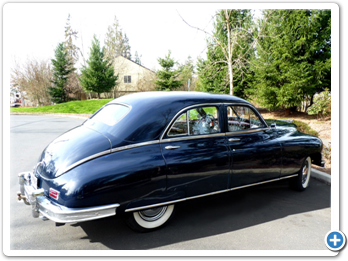 The other cars are fun, but the ‘49 is the one I depend on. I’ve had it all around the state of Oregon and up into Washington. I don’t know how many times I’ve taken it to the beach. I don’t worry about coming home in the ’49 because I know I’m going to make it. This is a book of contemporary road tests, specification and technical data, new model introductions, long term tests, development. 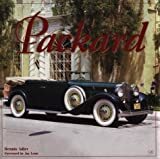 This book covers Packard’s Final Years. 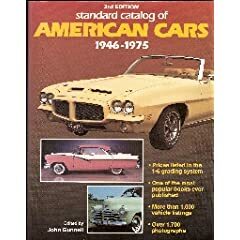 It includes the twentieth through twenty-sixth series, 5400 through 5600 series, and the final S7L and S8L series cars with factory & custom bodies. 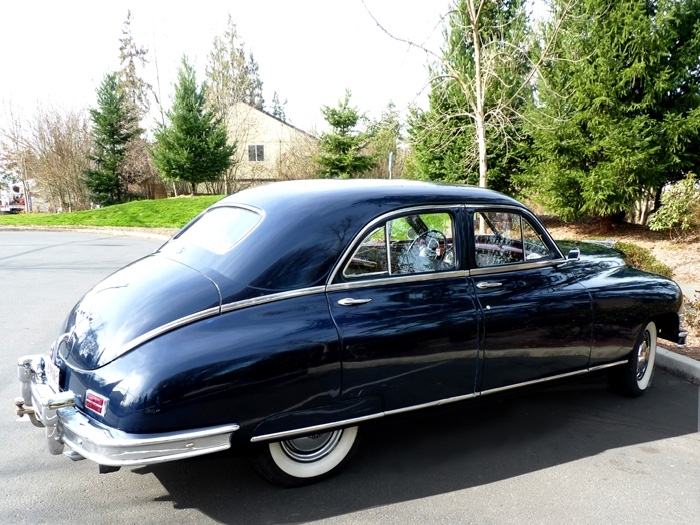 For the 1948 model year, Packard management wanted a lower, fatter body profile so they turned the design work over to Briggs Body Company, their production body builder. 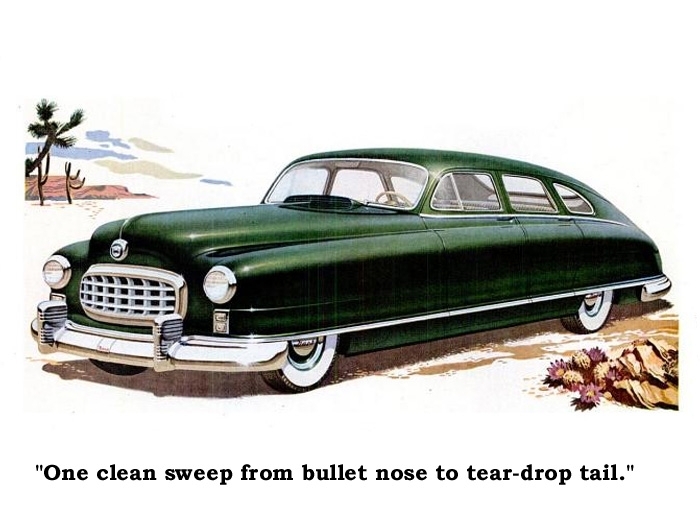 Many of Packard’s in-house stylists wanted simply to update the 1947 Clipper but management felt a more significant reworking was needed to keep pace with the rest of the industry. 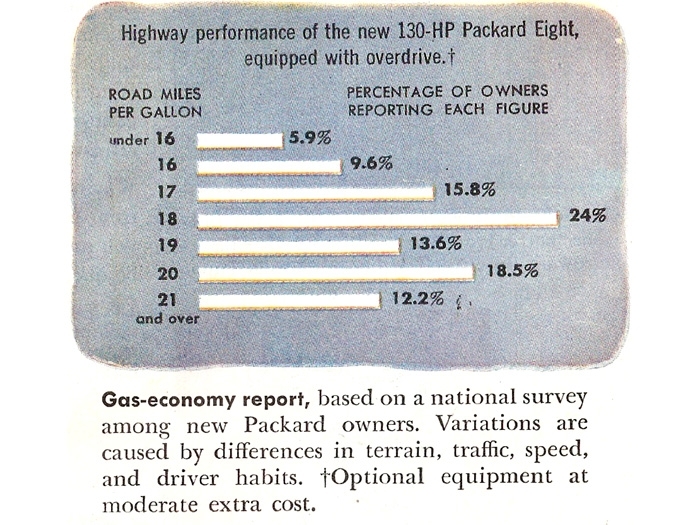 After all, the Clipper body had been introduced six years before. 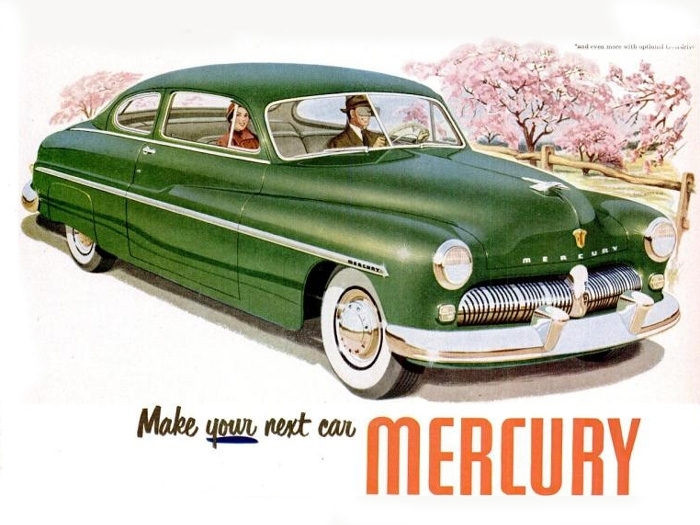 Lincoln-Mercury also chose the fat-bodied look in 1949-51. 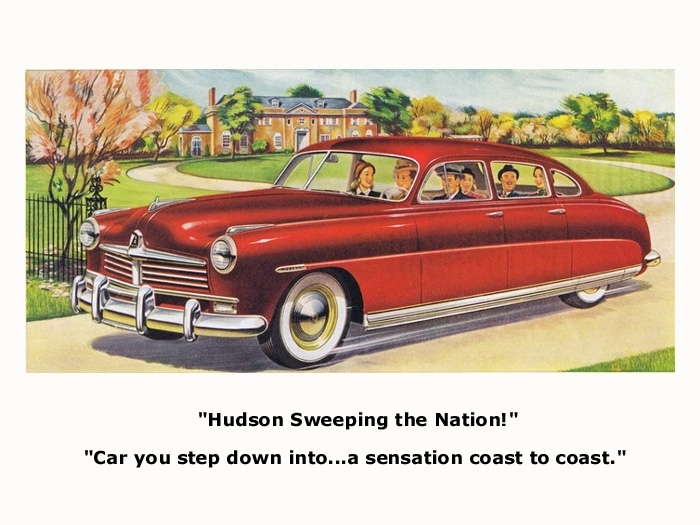 Hudson and Nash took the inflated look to extremes in 1948-49 and continuing (to a lesser degree) into 1957 on selected models. At first there was no indication that the bathtub-bodied look was a poor choice. 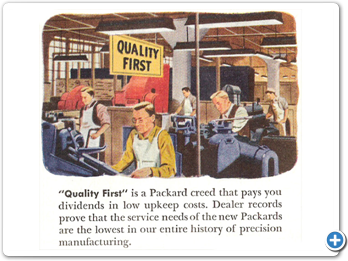 With record sales and praise from a number of international design organizations, Packard’s future looked bright. 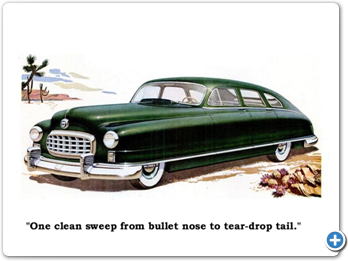 But, by 1949, GM introduced its Cadillac overhead valve V8 engine, and its lower, crisper, sleeker body designs, leaving Packard to play a losing game of catch-up for its remaining years. 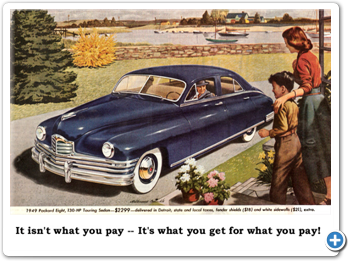 Buyers today are stepping up to the cars they’ll be proud to own ‘for keeps.’ Once again, they’re mindful that a little extra money buys a lot more car...and that the best quality they can buy is their best assurance of lasting thrift. 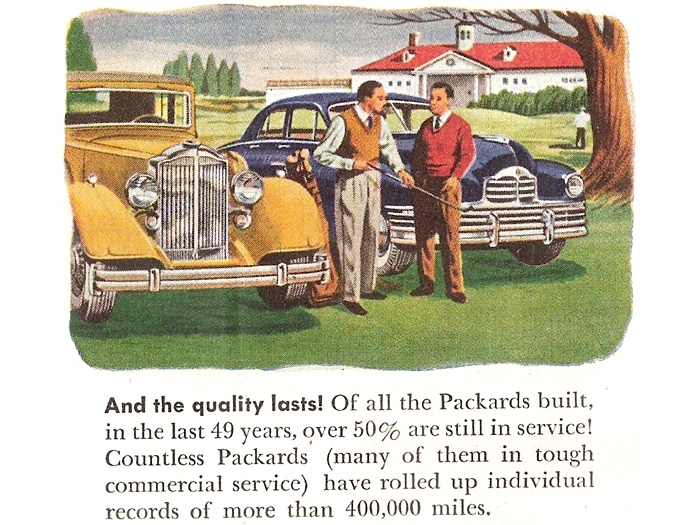 The ad continues with a series of panels describing Packard’s service record. 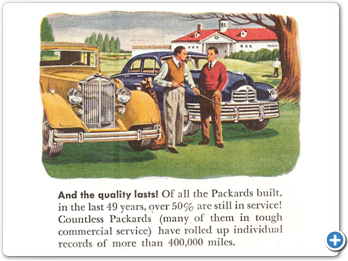 Half of the Packards ever built were still in service! 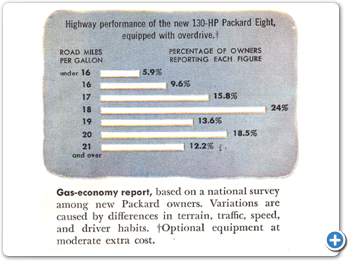 And 68 percent of new Packard owners reported getting more than 18 (road) miles per gallon when using overdrive with their 130 horsepower, eight-cylinder engines. According to the Standard Catalog of American Cars 1946-1975, in 1949, Packard built 27,438 Deluxe Eights out of a total production of 146,441 automobiles. 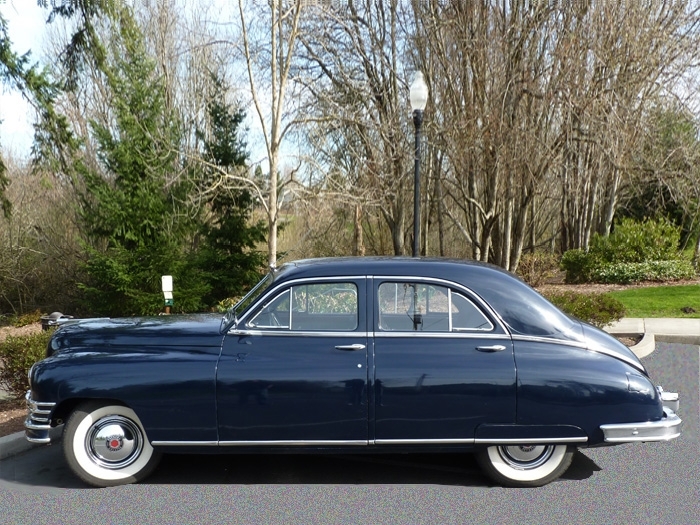 The factory price for the Deluxe four-door sedan six passenger was $2375. The shipping weight was 3850 pounds.